Nigeria Customs Service (NCS) has intercepted sacks of elephant tusks and pangolin shells in a warehouse at No. 38, Ogundana Street, Off Allen Avenue, Ikeja, with a combined Duty Paid Value (DPV) of N493.5 million. . 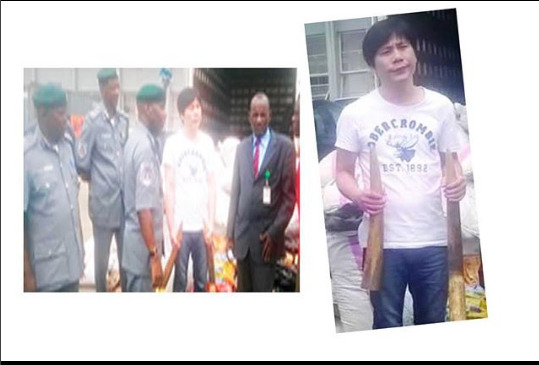 The unit also arrested a Chinese suspect, Mr. Ko Sin Ying, in connection with the items whose export breaches international protocols and conventions. .
Comptroller, Mohammed Uba Garba yesterday said the seizures comprised 55 sacks of pangolin shells weighing 2001kg and valued at N408.32 million, and 218 pieces of elephant tusk weighing 343kg and valued at N85.2 million. . He disclosed that the team, acting on intelligence, had mounted surveillance on the area and on a tip-off, raided the apartment where the security confirmed the occupant to be a Chinese national, Mr. Ko Sin Ying. Garba noted that the export of such endangered species of animals like elephant and pangolin breaches international protocols and conventions. .